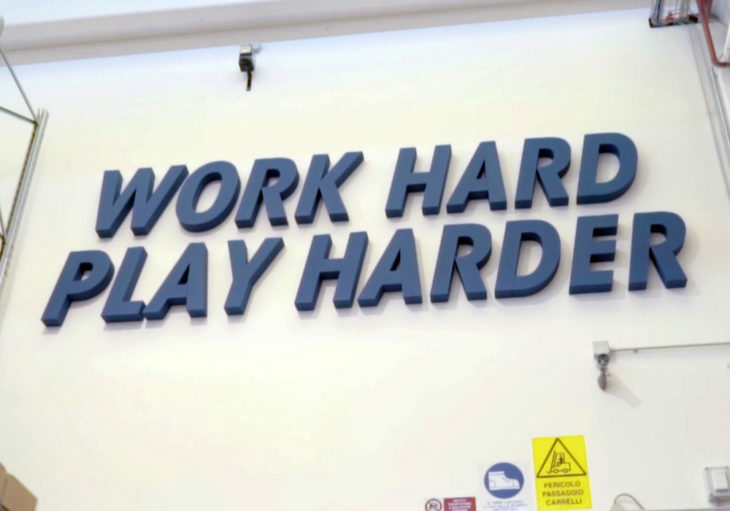 TORONTO – The words “Work Hard, Play Harder” were displayed in big, bold letters on the walls at Macron’s headquarters in Bologna, as Canadian Premier League Commissioner David Clanachan and the Italian kit manufacturer’s CEO Gianluca Pavanello toured the factory ahead of the announcement of the official kit partnership. It was fitting that those words, highlighted in the video above, hung overhead, for in the world of ever-homogenized soccer jerseys, Macron’s creativity in crafting bespoke uniforms spoke volumes when deciding on a kit partner for the CPL. Along with a travelling party that included Cavalry FC head coach Tommy Wheeldon Jr., Clanachan and the staff at Macron pieced together the 14 kits – seven home, seven away for each club – that the players will don in the CPL’s inaugural 2019 season, which will be officially revealed in early 2019. “Work Hard, Play Harder” displayed at Macron HQ in Bologna. With the league set to kick off in April of 2019, the design process for these inaugural jerseys will prove a critical part of differentiating the CPL from the rest of the world – very few leagues, for example, use custom-tailored shirts league-wide, a choice that Clanachan lauded. He explained that at one point during their work, he asked the Macron staff to display all 14 shirts side-by-side, in order to “avoid a group-think mentality” on certain design elements. Producing bespoke uniforms was a priority for the CPL. “When people use the term bespoke, it’s not a word that everybody understands. It really, truly means unique and custom,” Clanachan offered. “I can assure all of our supporters that we have created truly bespoke, custom, unique kits. I think that every Canadian will be proud of their league’s teams being dressed the way they are, home and away, but also pleased by the fact that each team’s home and away kits will be very different from every other kit in the league. I can’t wait. “I’m going to end up buying 14 different jerseys at this rate,” he concluded.